Cindy Crawford before and after plastic surgery, botox and collagen injections. 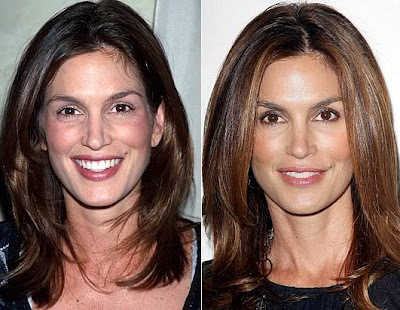 Ageless beauties seem to be the topic of discussion this week and i think Cindy Crawford falls right into that category, ageless and beautiful! And while the lovely model hasn't undergone any major plastic surgery procedures, she has confessed to regular trips to the doctor for botox, collagen and vitamin injections, since the ripe age of 29. Cindy Crawford: "I'm not going to lie to myself, past a certain age, creams work on the texture of your skin but, in order to restore elasticity, all I can really count on is vitamin injections, botox and collagen". This may come as a surprise to all those people who believed miss Crawford was an all natural beauty, but at this point if botox and collagen is all you have in the closet, your doing pretty well. At least she hasn't dabbled in any drastic plastic surgery operations, i.e nose job, facelift. In regards to vitamin injections, i think this should be a first thought for many celebrities who jump right into extreme plastic surgery. Cindy Crawford closeup photo of botox results. Can't really call someone that has had cosmetic surgery on their face an "ageless beauty". geesh! give the lady a break, she looks fantastic, looks better than some young people. but, really she does, if you look at the before picture, she actually looks younger, so I dont know why she even injects that stuff on her face, she would be better off natural, because indeed she is a natural beauty. after reading this I won't be ordering her Meaningful Beauty Product. According to her, her ageless has skin is because of her Beauty Skincare line. I read here she has had Botox injected on her face, so her beauty skincare line defeats the purpose. We are all getting older and the best thing we can do for ourselves is drink tons of H2o, and moisturize!!! I am on the heels of 53 and I am always given complements that I look much younger. Trust me ladies and gents, water, moisture staying out of the sun and stop smoking!!! Unless you have tons of cash like Cindy you gotta take care of you. Shame on Cindy for getting paid for using Botox and claiming Meaningful Beauty is her only saving grace. Tee hee hee. Silly girl. I cannot see anything that out of the ordinary other than she probably had some crap injected into her lovely face. In other pics I have seen she looks like a forehead lift or eye job. Women grow up...grow old gracefully...and keep your face; it is the road map of your life and the root of your family.